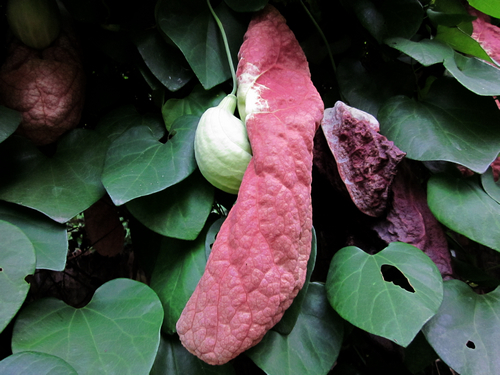 Aristolochia gigantea (Brazilian Dutchman's Pipe, Pelican Flower; syn. Aristolochia sylvicola Standl.) is an evergreen, fast growing vine, native to Brazil. Aristolochia gigantea 'Pelican Flower' - Even in partial sun, this Brazilian vine displays large, heart-shaped leaves and unique flowers. Ivory veining against a burgundy velvet background with long tubular flowers reminds us of its coined name"Dutchman’s Pipes." 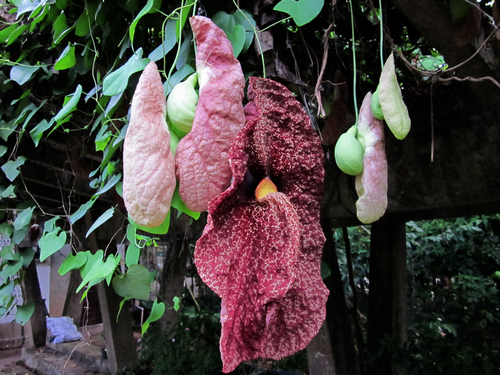 Aristolochia gigantea 'Brasiliensis' - Spectacular flowers, up to 1 foot long (30 cm), this species from Brazil is huge. Each flower displays an intricate pattern of white and mottled reddish-brown. Draw close to it and smell its lemon scent. With a little training, it can be contained to a limited space, such as a hanging basket.